Etta was not happy about her crate when I got her. She now will retreat to her kennel when she needs a rest at public events we go to. It is so nice to have her be able to relax and feel safe! Crate training is a valuable and worthwhile exercise. Most dogs will need to be in a crate at some point in their lives at a veterinary hospital, groomer or boarding kennel. These places are inherently frightening and stressful for a dog, but much more so if they now feel trapped and are not used to being calm in a crate. At no point in time should a dog be stuffed into a kennel, have the door slammed and locked and be left alone to “learn to deal”. That is a fabulous way to create a dog who is terrified of being crated. Take the crate to the center of the room. Bring a big bowl of tasty treats, your clicker and slightly hungry dog. Sit alongside the crate. Many dogs will look at the crate while they sit next to you. If they look or move towards the crate, click and give them a treat. Repeat this until they are actively looking or moving towards the crate. If the dog seems comfortable being near the crate, try tossing a treat just inside the door. If the dog reaches in to pick it up, click and toss another. Repeat this a few times and then wait to see what the dog does. If the dog investigates father in, click and give a few small treats one after another. Continue until the dog is all the way in the crate. Then give several more treats and speak happily. Allow the dog back out of the crate and then ignore them for a few moments. Begin the crating process again. The dog will learn that good and exciting things happen in the crate! Some people choose to feed their dogs meals in their crate as well as give them special treats like bones or chewies only in their crates. This helps to make the crate extra pleasant, as well as preventing fights between dogs over high value resources. It is important to not feel like this is "doggie jail". This is your dog's safe place, a bedroom of his own. Just as your parents did not let you out of your room every morning with a lot fan fare, make sure you are calm when releasing your dog from the crate. I suggest going one step further and only release your dog if he is sitting and calm. If potty training your puppy's crate should be big enough for him to stand up, turn around and lie down comfortably, but no bigger. As your puppy grows make sure the crate grows with him. Many crates now come with divider panels so you only have to buy one crate! Once your puppy is potty trained, his crate can be as large as you have room for! Some puppies are happier in a wire crate where they can see all around them. Others are more secure in hard sided plastic crates. 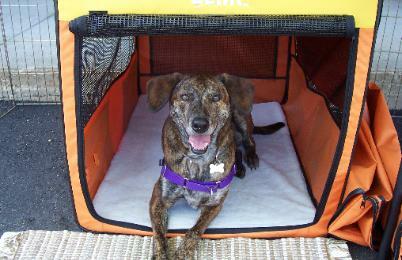 Soft sided crates are not a good idea for any unattended dog because they can chew their way out and move them around! I would advise purchasing a wire crate which usually comes with a divider so it can grow with your puppy. If you have a dog or puppy who craves more privacy you can place a sheet or blanket over it. If you have a dog who will pull material through the bars (like mine always have!) then you can get a piece of plywood or "Coroplast" (a corrugated plastic found at sign making shops) that is just a little wider and longer all around than the size of the crate and then place the blanket on that. This will keep the blanket held out away from the bars and the naughty teeth!